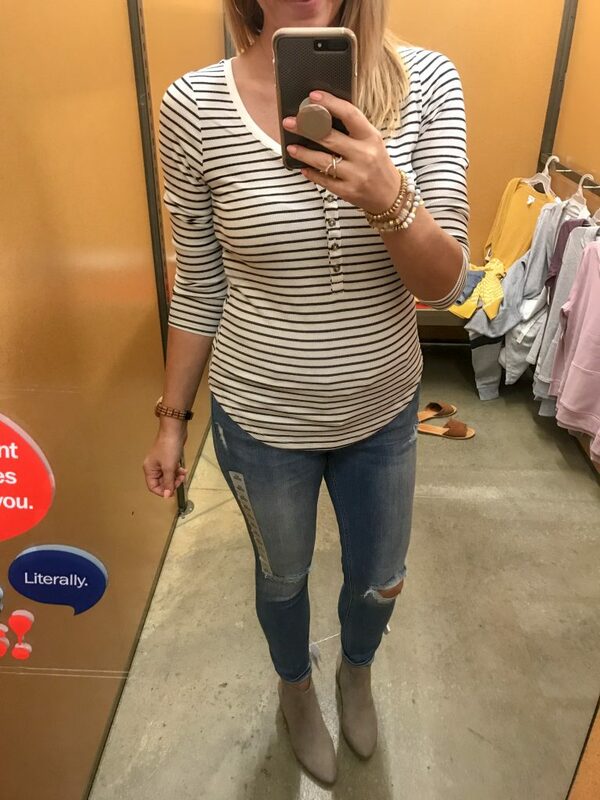 Shopping during that in between stage of pregnancy when you don’t quite have a full on baby bump yet, and you don’t exactly fit into your jeans anymore can really challenge a girl’s confidence… Ahh… the beer belly phase!! But I had some Old Navy Fast Cash burning a hole in my pocket and I can’t let a good deal go to waste! 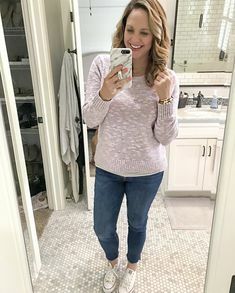 I’ve always been an Old Navy girl, but I feel like they’d really upped their style game lately, so I thought it would be fun to do a little try on session and share my favorite pieces on the blog. 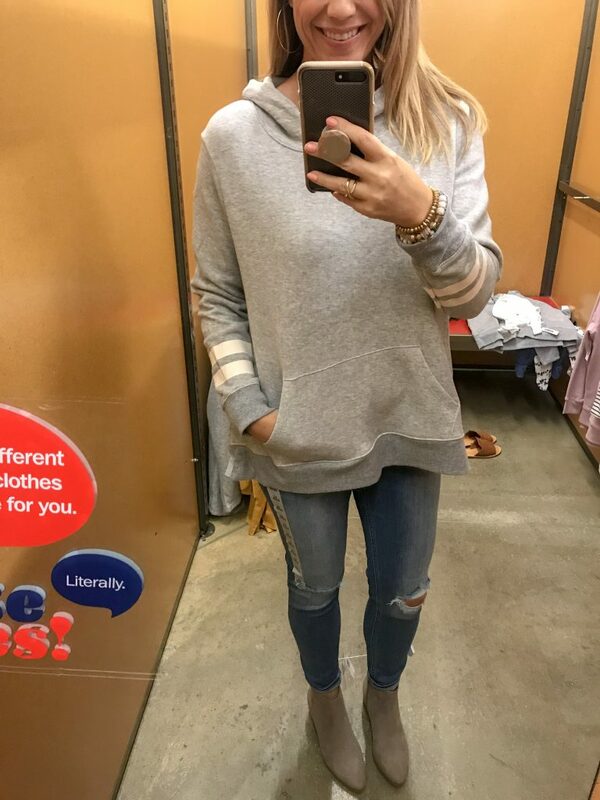 I didn’t try on a ton of stuff, just everyday basics that fit my lifestyle and I would wear on a regular basis. 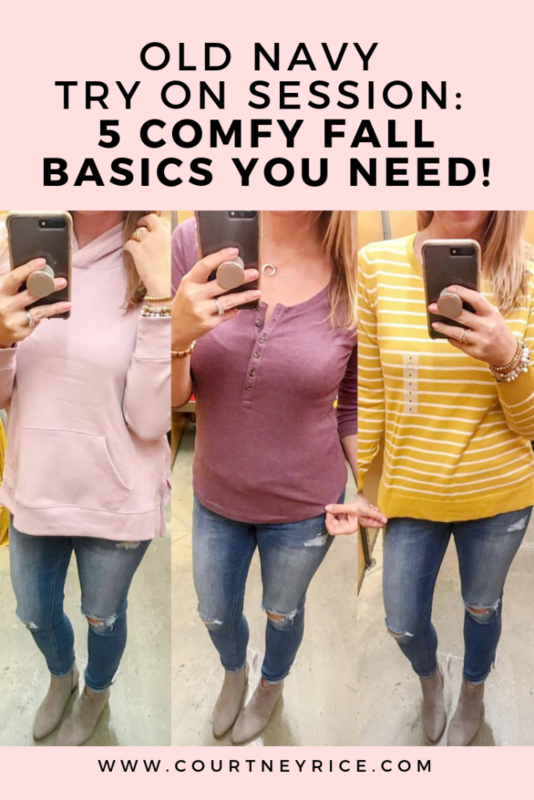 SO, here is my Old Navy Try On Session: 5 Comfy Fall Basics You Need. This Slim Fit Ribbed Henley top comes in several colors and is a great fall option with it’s 3/4 length sleeves. I’m envisioning wearing this stripped version with a utility vest or a lightweight camo jacket when the weather drops down into the 60s. So cute! 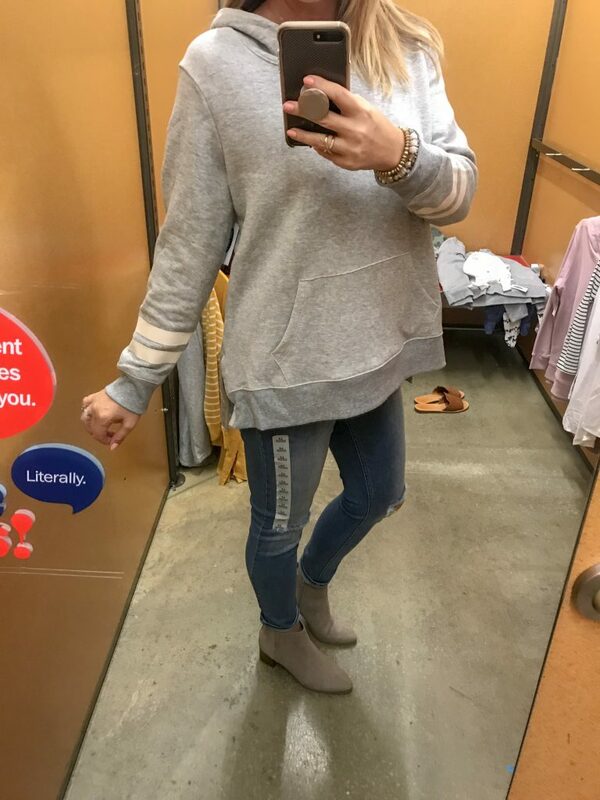 These Mid-Rise Distressed Rockstar Super Skinny jeans are so stinking cute and flattering, too bad I can’t zip them up, haha! I will definitely be purchasing these as postpartum goal jeans! By the way, I’m wearing a Bella Band to hold up my pants in all of these pics in case you’re wondering why it looks like my pants are unsnapped — because they are! The band is every pregnant girl’s best friend. Style tip: The band work best with looser fitting tops so you don’t see the outline of your unsnapped pants!! For sizing references, I’m wearing a large in the Henley. 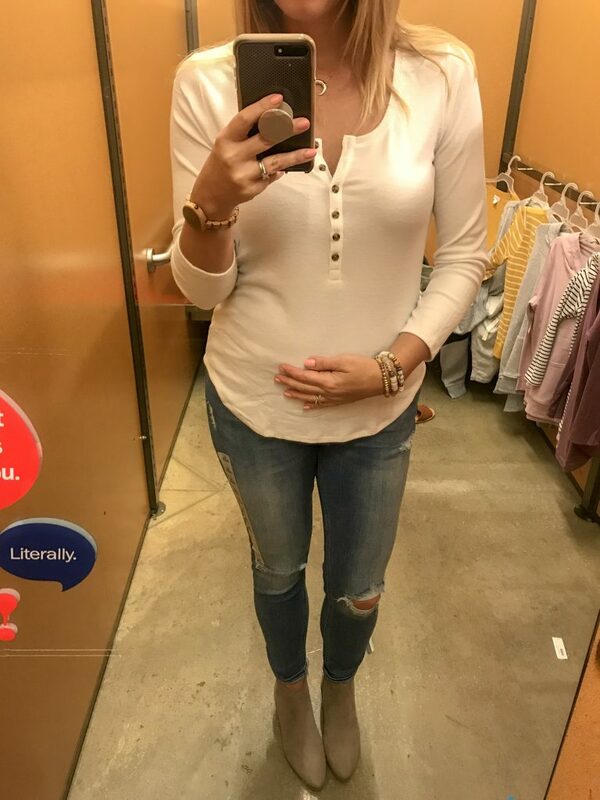 I sized up to a 12 in the jeans (typically wear a 10), still can’t button, but you get the idea! 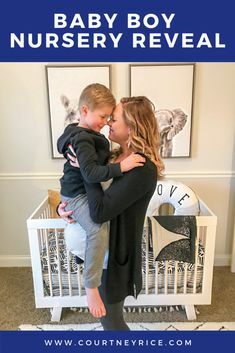 Click any of the links in the blog to shop these items. 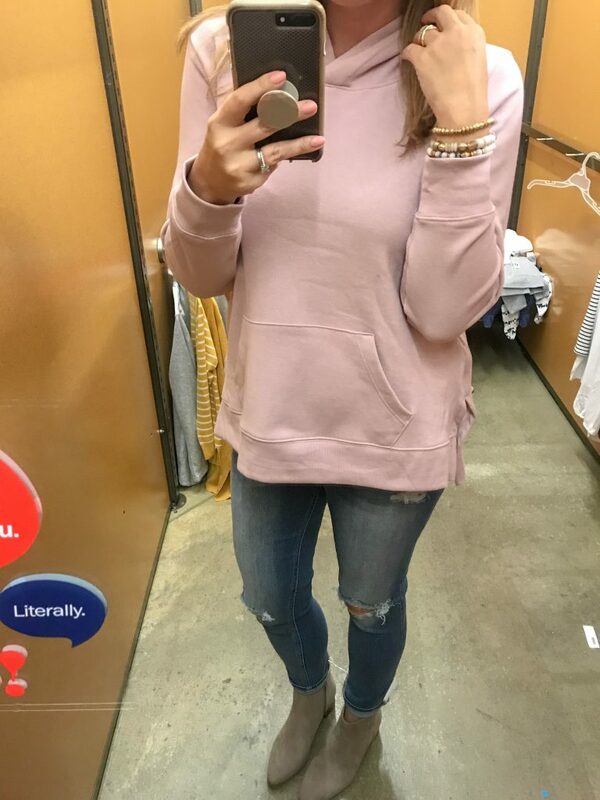 I love me a good hooded sweatshirt, and this Relaxed Pullover Hoodie in Plum Tonic is cute enough to wear as an outfit with skinny jeans and booties. I love anything blush colored, so I definitely snagged the plum color. I also really want this Heather grey color with the varsity stripes on the sleeves, a really popular trend right now. The sweatshirt is over sized, I’m wearing a Medium in the plum and a large in the grey. 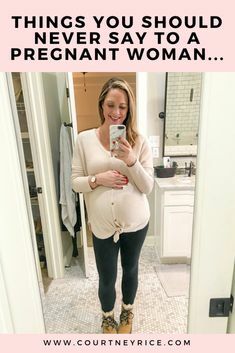 The medium fits me perfectly now, but when I’m 8 months pregnant I want something that will drape comfortably over the bump and not be too short, so I sized up to large thinking ahead! 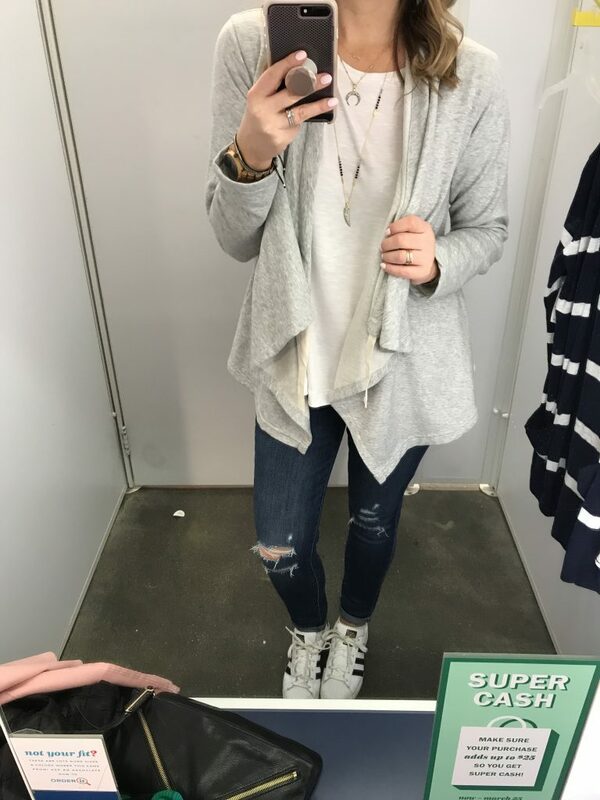 Loving this Boyfriend V-Neck Cardi. 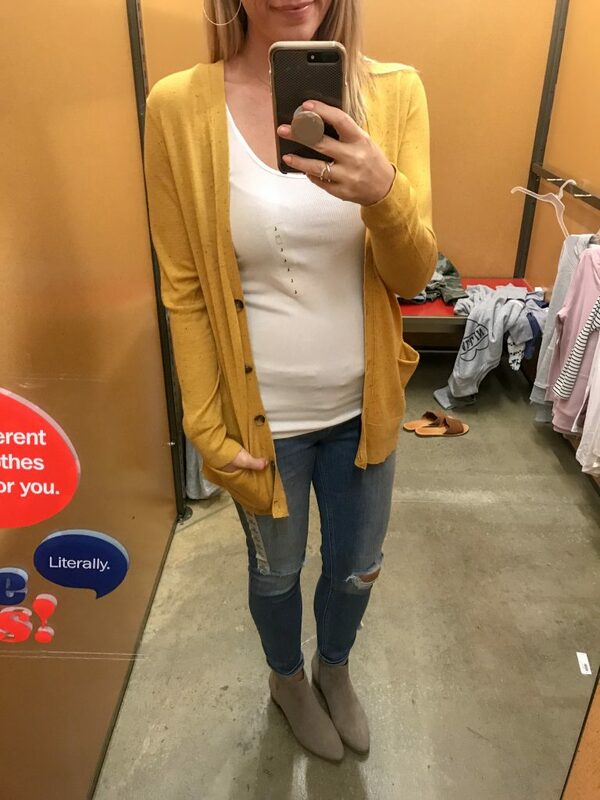 Cardigans are wonderful for pregnancy, because all you need is a maternity tank and you can wear non-maternity cardigans the whole time. 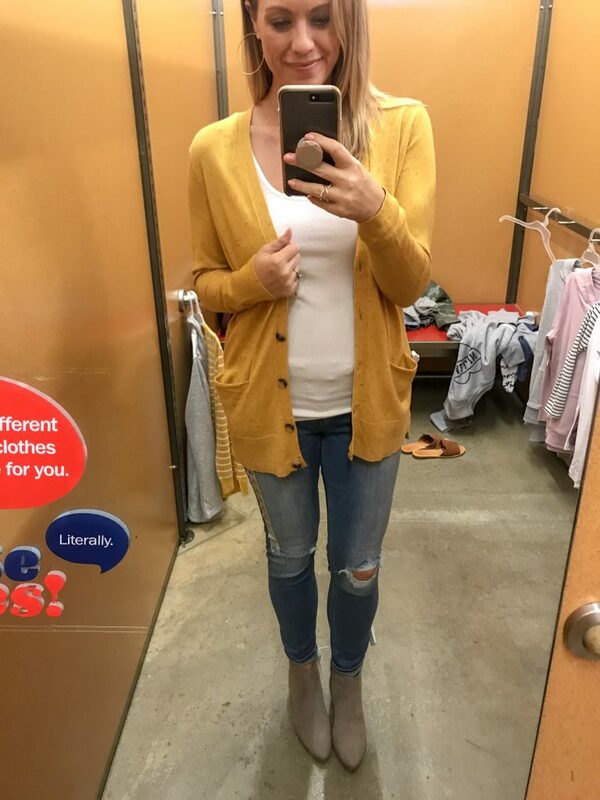 I am really drawn to anything mustard colored right now, which is obvious by the growing mustard yellow section I have in my closet. You guys color code your closet too, right?! I liked that the buttons are brown too, a nice contrast. 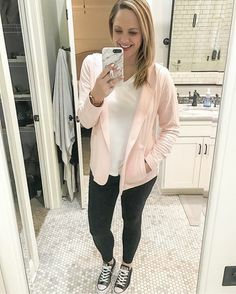 This cardi comes in 6 colors and I’m wearing a medium. OK, remember how I said I have a mustard yellow thing going on right now? 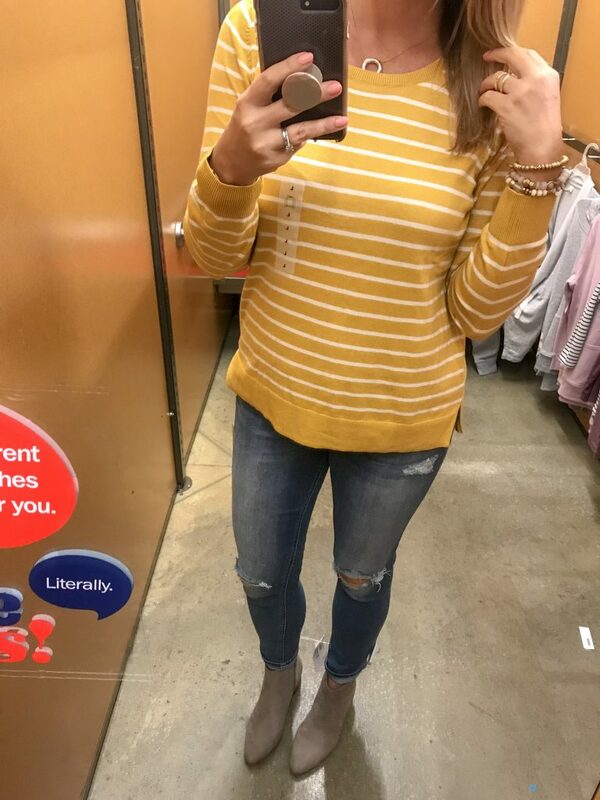 Well exhibit B – another mustard top! 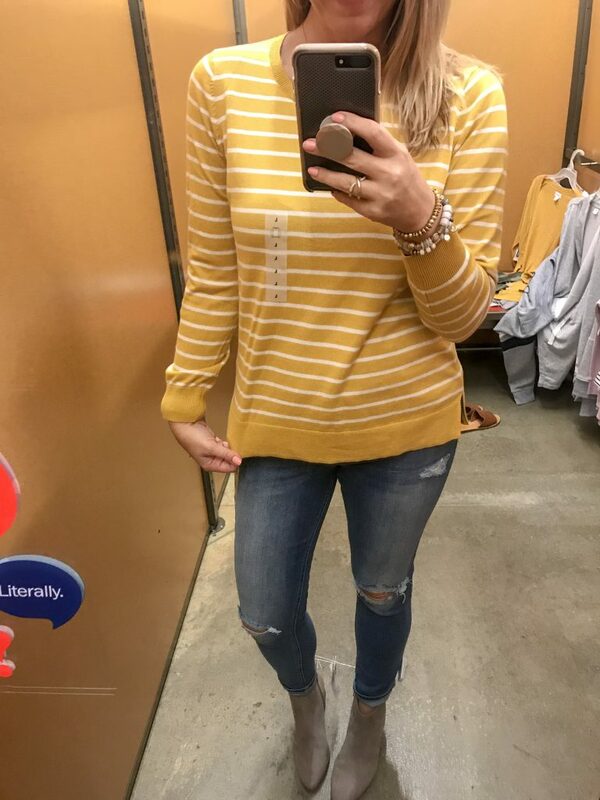 I loved this Crew Neck Sweater because it’s lightweight, soft, striped…….and mustard yellow! Technically it’s Lemon Stripe! It’s an easy sweater to throw on for work, errands, school functions, or church. 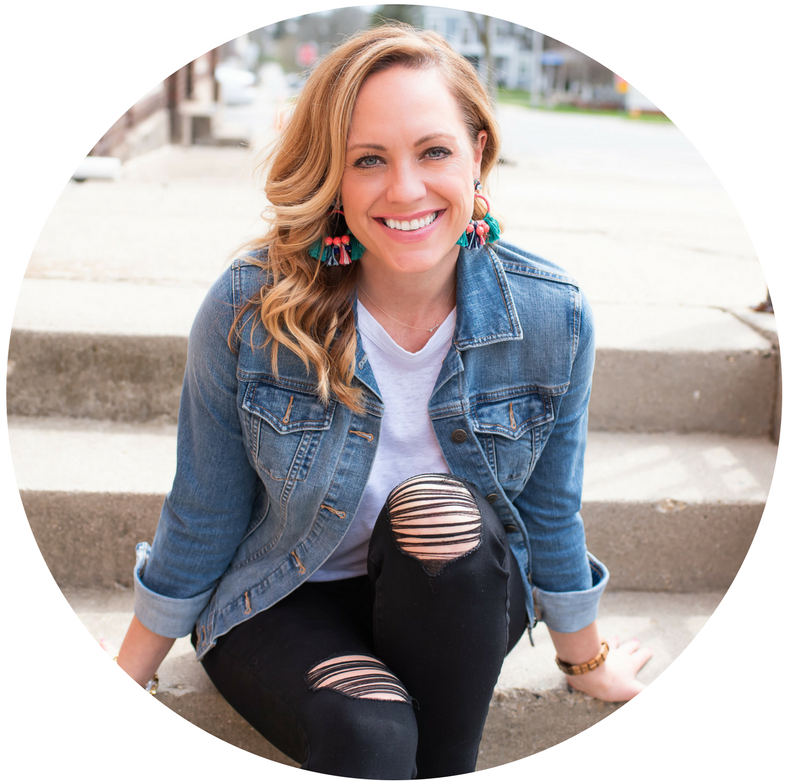 I’m wearing this Cinched Collar Open Front Wrap as I’m trying this blog — so comfortable! 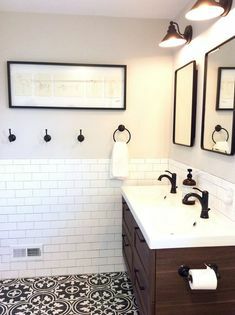 I actually tried this on back in the spring (pictured below) and didn’t get it and it’s been on my mind ever since! Now it’s finally in my closet, where it should be. It’s like a cardigan so it’s more stylish than a basic sweatshirt, but it’s sweatshirt material. I will be wearing it on repeat all fall and winter! 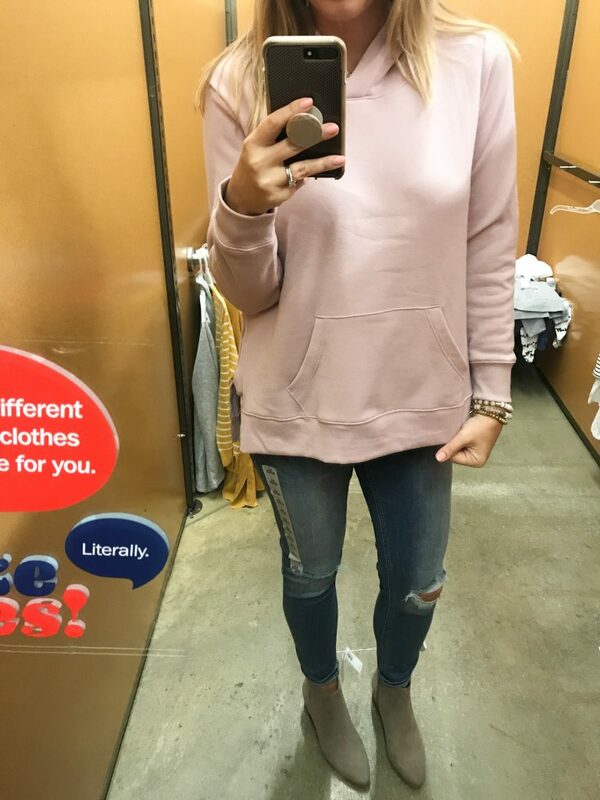 I’m wearing a large in the above photo but sized down to a medium for the one I purchased. The pic below is a medium. It’s funny, the more I spend at Old Navy, the more Fast Cash they seem to send me. 🙂 I’ve probably had 3-4 in-store and online transactions in the last week, eeks! 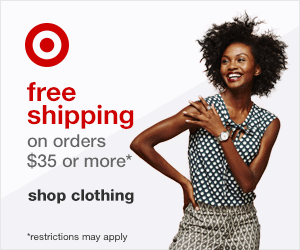 Are you loving Old Navy right now, too? You can’t beat the prices and the every day basics. 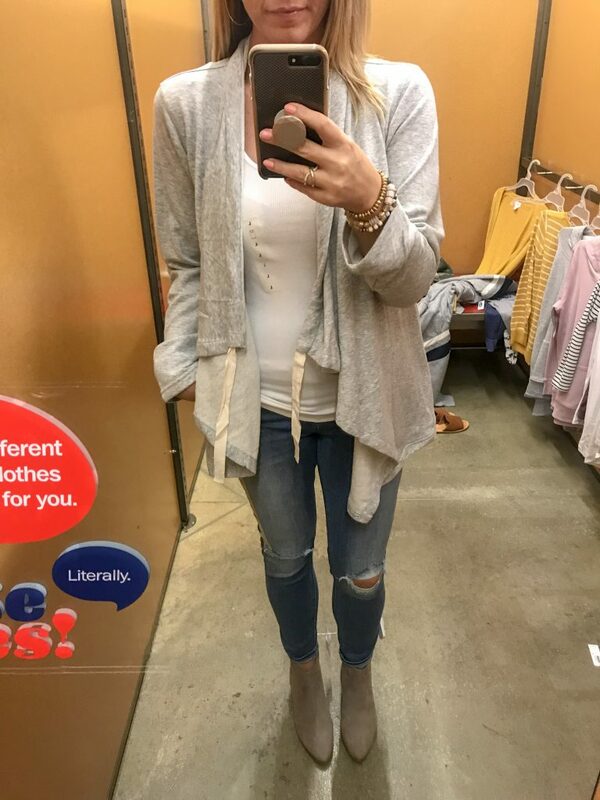 I hope you enjoyed this Old Navy try on session… I always enjoy watching other people do them on their blogs and Instagram, love seeing the fit and details on real people! Let’s be internet friends! 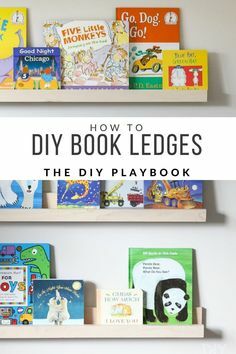 Never miss a hilarious thing I say or a fun style post like this by subscribing to my blog newsletter HERE. 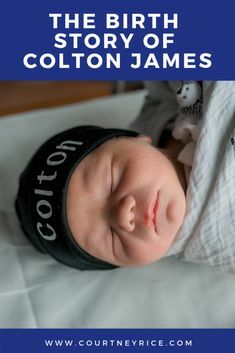 « Baby Gender Reveal: Oh boy, oh boy, IT’S A BOY! !